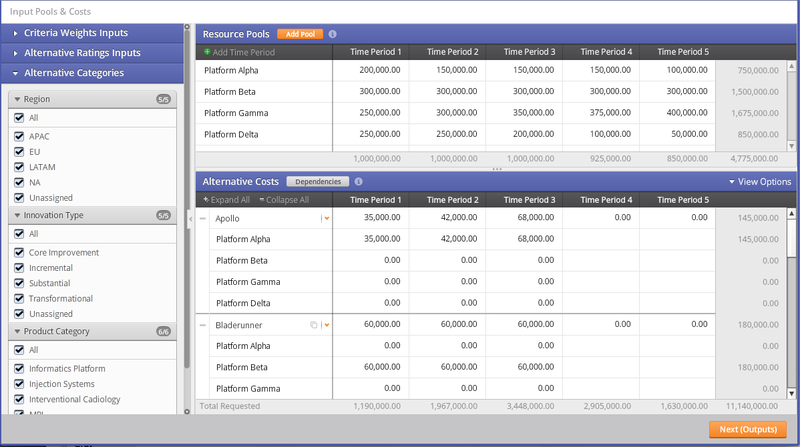 The Allocate Input screen is the main entry point for all alternative cost requests from. Funding constraints such as hard and soft minimums can be set to direct funding to specific alternative based on funding rules. 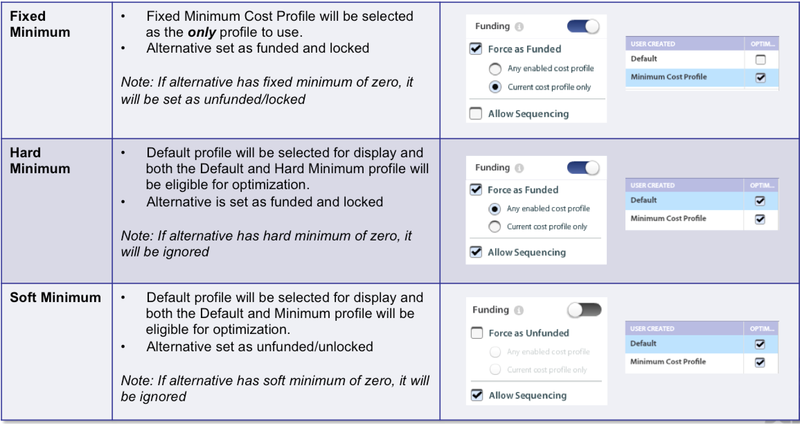 The Alternative Costs screen shows a summary view of how the funding requests span the time periods and the funding rules which are applied within the scenario. Type a resource request for each alternative by entering a number in the Request field. Mixed request - the alternative can draw from both pool A and pool B to sum to the request. Multi Pool request - the alternative can draw from either pool A or pool B to fulfill the request. Check the Totals column to verify that the alternative request and the pool requests equal. A funding minimum value can be entered for each alternative being considered for allocation. The funding minimum cannot exceed the alternatives overall budget request for the time period it is entered. When importing a model created using previous methodology for setting minimums, each alternative with a minimum will automatically have a new "Minimum Cost Profile” created for that model. Fixed Amount - is a set amount that an alternative will receive regardless of benefit / cost merits. This can be used to force fund or exclude an alternative from receiving resources. Hard Minimum - is a set amount that an alternative will receive regardless of benefit / cost merits. The alternative will be allocated at least to the hard minimum and can receive more funds if the benefit is worth the cost. Soft Minimum - is an amount that an alternative must receive if it gets any funding at all. The soft minimum prevents the alternative from getting less than is needed at the most basic level for it to be successful. The optimizer will check the soft minimum and either not fund the alternative if the benefit score is too low; or it will fund the alternative within the range (min to max request) if the benefit/cost is worth it. Constraints are rules that can be defined to document relationships between decision alternatives. These constraints can be defined between two Alternatives with the relationship of Requires, And, or Or. To add or view Dependencies, click on the button in the Allocate Inputs, Alternative Costs table.